Inviting twenty-five artists to propose memorials to the Iraq war, the ICA attempted to remember tragedies that continue to unfold on a daily basis. The exhibition guide gave a comprehensive timeline of the events in Iraq, starting from Iraq’s invasion of Kuwait in 1990. It was clear that the ever-expanding death toll of today’s conflict was the main focus of this exhibition. Intriguingly, the opening of “Memorial to the Iraq War” coincided with Tony Blair’s departure from office. Media pundits have tended to define the war as the former prime minister’s most significant legacy, and the exhibition appeared to test contemporary art’s capacity to explore catastrophic contemporary geo-political issues. The exhibition set out to present works that were memorials (commemorative, sorrowful entities), rather than monuments (commonly more celebratory), but this distinction was not always clearly differentiated. To some artists, this may have been mere semantics, but those who made the distinction seemed more directly engaged with the exhibition’s premise. 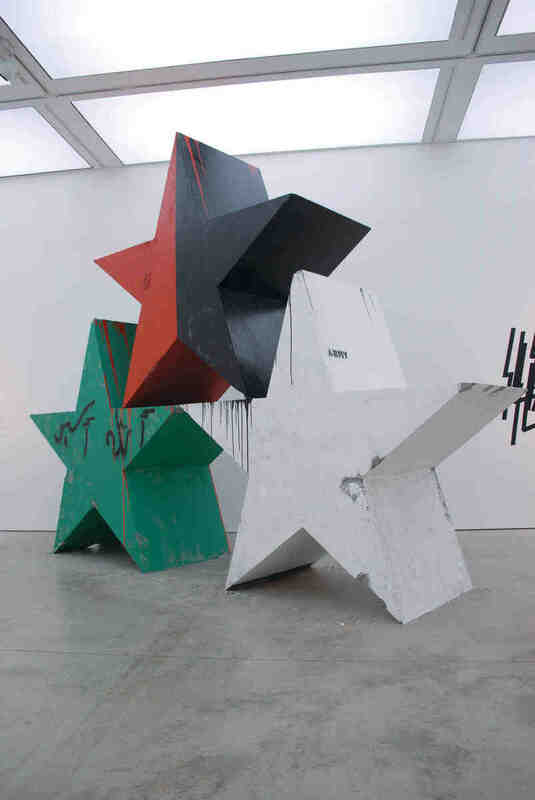 Mark Bijl’s Iraqi Stars (proposal for a monument), was one of the more reflexive contributions to the exhibition. Comprising three large, crudely and cheaply made stars balanced in a simple configuration — one green, one white, and one red and black — it was one of a handful of more monumental works in the show. Bijl intended the work to operate on a simple, symbolic level. For him, the green represents Iraq, the white the US and coalition forces, and the red and black, anarchy. For the viewer, the colors could have other meanings — red for blood or black for oil, for example. Given their appearance on the American flag and the flags of many Islamic countries, Bijl’s use of stars appears to provide an easy East vs. West dicho­tomy. But the strength of the work lay in its suggestion that monuments provide highly accessible visual routes into symbolic gestures. The work investigates our consumption of death, both the physical consumption of cadavers and the visual consumption of war and tragedy through the media. The empty white cube seemed fitting, acting as a reminder that the exhibition was ultimately bound by the hermetic nature of the art institution. The memorial attempts of some artists seemed stifled by the con­fines of the gallery. Collier Schorr’s Memorial to Lost Limbs, which fea­­tured framed collages of human limbs taken from magazines; and Vahid Sharifian’s Bush Distance Family, which showed smiling portraits of George W. Bush’s relatives taken from the Internet, appeared to be works made for the walls of a gallery, rather than memorials as such. The show explicitly highlighted the left-leaning, politically liberal posture of the contemporary art world, after all, pro-war art was unlikely to make an appearance. Given the ICA’s audience, Memorial to the Iraq War preaches to the converted. But the project is made more pertinent by its afterlife: the institution aims to realize some of the proposed memorials and present them in public. Though “Memorial to the Iraq War” was voguish in format, following the recent proliferation of exhibitions inviting a group of artists to respond to a given theme, it still felt like a strong and worthwhile exercise. “Memorial to the Iraq War” bore more than a passing resemblance to the exhibition “Monuments for the USA” presented at the the CCA Wattis Institute, San Francisco, in 2005. The latter again invited a large number of artists to develop proposals for monuments that they believed the people of America “need or deserve.” The more engrossing works didn’t question the role of politically motivated art and looked instead to memorialize a complex and ongoing phenomenon. This was an attempt at curating a genuine engagement with politics, which is more than can be said for many recent exhibitions that strike political postures. Yet, it ended up scratching at the surface of its own idea. The potential energy of the project is yet to be released: it will be interesting to see which memorials are selected for a life outside the gallery, and how they fare in the public realm.